This is the first selection for the Adult Book Club's Winter Session. I chose it because with all this yucky cold weather, we could use something fun and zany. 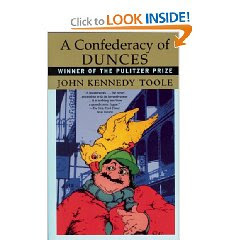 The fact that it's set in New Orleans merely adds to this madcap adventure about the life and times of Ignatius Reilly. Ignatius is a fat, flatulent, opinionated scholar (he frequently cites Boethius) who lives with his frazzled mother who is desperate to get her son out of the house and out of her hair. Lots of weird things happen throughout this book and everything comes together quite nicely at the end. I'll be curious to see what everyone thinks at the next Book Club meeting.